As someone who personally experiences all the health and other benefits that come from being surrounded by nature, I am glad to be on the staff of Mountainside Education and Enrichment. MEE teaches, demonstrates, and engages all ages in scientific explorations and environmental sustainability through a variety of in-school and outdoor lessons and field trips. Last summer 30 youth from City of Frederick Housing Authority communities benefitted from the generosity of Joe Richardson who sponsored them so they too could immerse themselves in nature and participate in outdoor summer camp experiences at Bar-T Mountainside. Through its new Sponsorship Fund, MEE hopes to give this opportunity to even more urban youth and you can help! 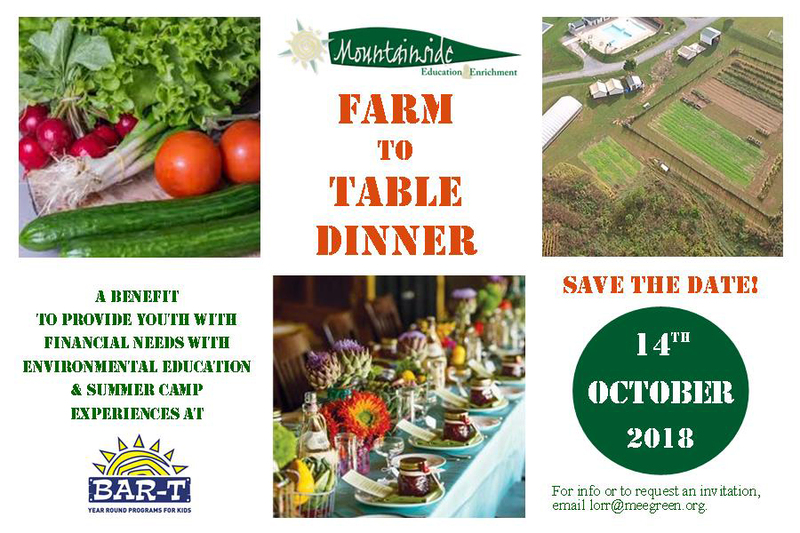 Come share the bounty of Bar-T Mountainside’s farm and other local producers at Mountainside Education and Enrichment’s first Farm to Table Benefit Dinner on Sunday October 14! Click on the image to open a larger version! By dining at the beautiful Bar-T Mountainsides farm campus at 2914 Roderick Road in Urbana, you’ll be funding sponsorships and giving urban youth summer camp experiences that include challenge courses, hands-on agricultural and environmental experiences, and lots of outdoor fun. Doug Kellner, Executive Chef of GrillMarX Steakhouse & Raw Bar will create a memorable dining experience. The event also features a special video presentation by Florence Williams, author of The Nature Fix, Why Nature Makes Us Happier, Healthier, and More Creative. 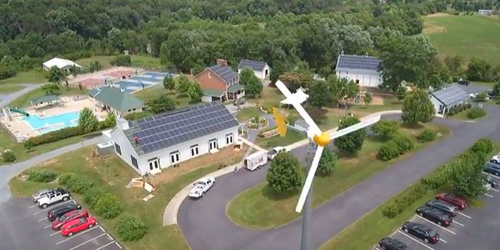 Between 4 and 5:30 p.m., interested guests will also have the opportunity to tour Bar-T’s farm, green building, and the renewable energy systems that have made Mountainside a net-zero energy campus. Tickets include beer, wine, hors d’oeuvres, and dinner and must be purchased in advance. Attendees must be age 21 or over. Lisa is the Executive Director of Mountainside Education and Enrichment.